Motorists have been hit by £115,000 in fines in just a week since bus lane restrictions were re-enforced in Preston. 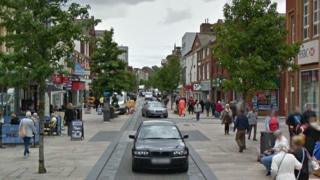 Lancashire County Council previously switched off the cameras on Fishergate due to inadequate warning signs. But in the seven days after turning them back on, 1,924 drivers were fined £60 each - about £16,000 per day. Councillor Keith Iddon said: "Everybody was well advised. The signs are obvious enough." The authority's executive member for transport added: "I don't want to see anybody get a fine. It's not pleasing to me." The bus lanes, which run between Mount Street and Corporation Street and at the junction with Butler Street and Corporation Street, are in operation from 11:00 to 18:00 every day. Image caption The council has insisted new signs warning about the cameras are "obvious enough"
The council previously agreed to refund 23,000 motorists who had been collectively fined £1.3m after the Traffic Penalty Tribunal Adjudicator ruled in favour of six motorists who challenged their fines. Mr Iddon said improved signing had now been installed, including larger signs. "My whole aim in this is to keep this a shared space fore everybody, keep the buses running through, make it a pleasant experience", he added. He said motorists continued to "abuse" the rules, despite the cameras operating for a "short period".